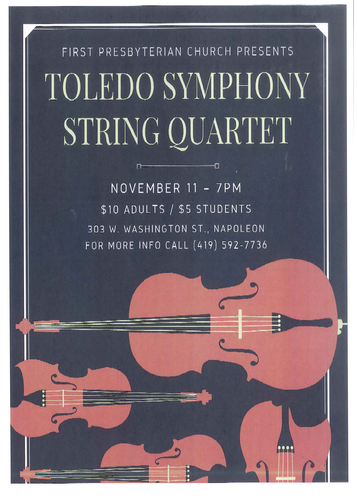 The Toledo Symphony String Quartet will perform a concert in Napoleon at the First Presbyterian Church on Sunday, November 11th! The public is invited to enjoy an evening of musical selections ranging from the classics to songs from Broadway. The four musicians include violinists Merwin Siu and Cheryl Trace, cellist Robert Clemens and Reed Anderson playing viola. All are long-time members of the Toledo Symphony Orchestra. Tickets are available at the door. $10 for adults and $5 for students.